Well, y’all, I’m feeling stalled on my dining room. I have so many repetitive projects still to do in there — four more Roman shades, one more built-from-scratch wingback chair, six side chairs to upholster — and it’s feeling a bit overwhelming, especially since I’ve kind of convinced myself that I HAVE TO get these things done before I can move on to something else. I don’t work well when I put those limitations on myself. So for now, I’m going to start spending my days working on the big projects in the hallway, while spending any “free” time catching up on those repetitive dining room projects until they’re finished. In the meantime, Matt and I are going to get the floor leveled in the breakfast room/pantry and have the room drywalled so that that room will be ready for me to start on as soon as I’m finished in the hallway and dining room. I’ve already done quite a bit of work in the hallway, but it still looks like a construction zone. When we bought the house, the hallway had two closets opposite each other right at the doorway into the hallway. The bigger closet was obviously an add-on, and was probably built sometime in the 70’s, if the door hardware is any indication. I ripped that closet out before we even moved in, and before I refinished the hardwood floors. The other closet that was opposite that one was original to the house. It was the original coat closet. 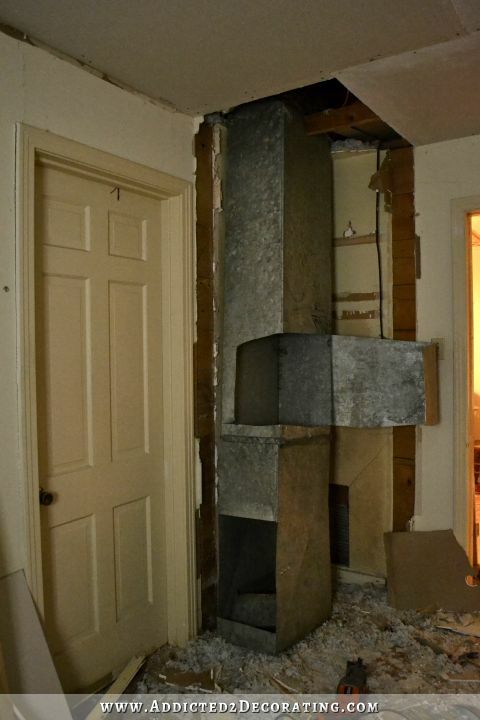 But then when the furnace was added, that closet was used to house the huge intake duct. 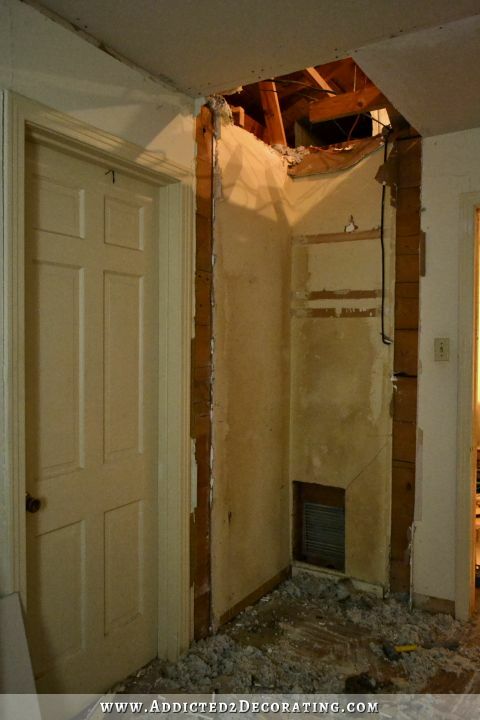 I tore out that closet, and the duct, when I remodeled the hallway bathroom. Getting that massive duct out of there by myself was no easy feat, I can assure you. But I finally got it all out of there, and was able to move and widen the bathroom door. The bathroom now has double doors on it that open out into the hallway. It’s a bit unconventional, but it made the bathroom feel so much more spacious without a big door swinging into the bathroom. And also during that remodel, I added new drywall in the hallway on the wall between the hallway and bathroom. So while that’s quite a bit of work that I’ve done so far, it’s still no where near finished. One room (my office) doesn’t have a door on it at all. It was only one of two original 30-inch (or was it 32-inch?) doors in the house, and I needed both of those doors to make my sliding doors in the music room. So my office hasn’t had a door on it quite some time. The other two rooms still have the original doors on them, and they’re still covered in random paint samples and stain from way back when I thought I might keep the original doors and even strip and stain them. 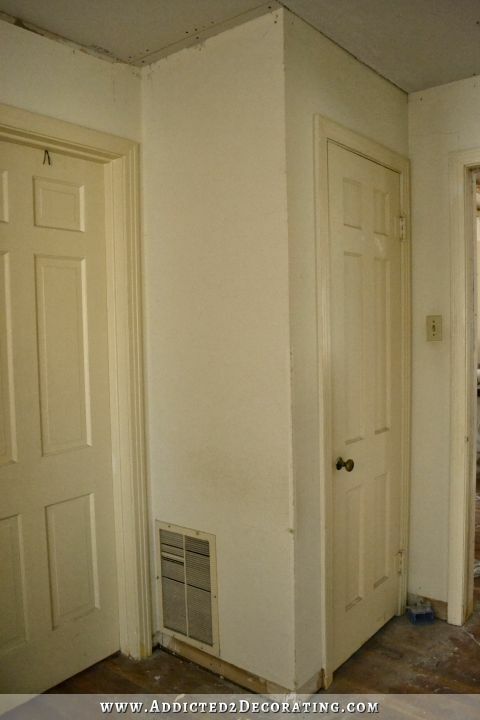 This is an old picture (from before I removed my office door on the far left, and even before the bathroom remodel), and yet these two doors still look like this. So that looks like a complete mess. 2. Install new doors on the rooms. 3. 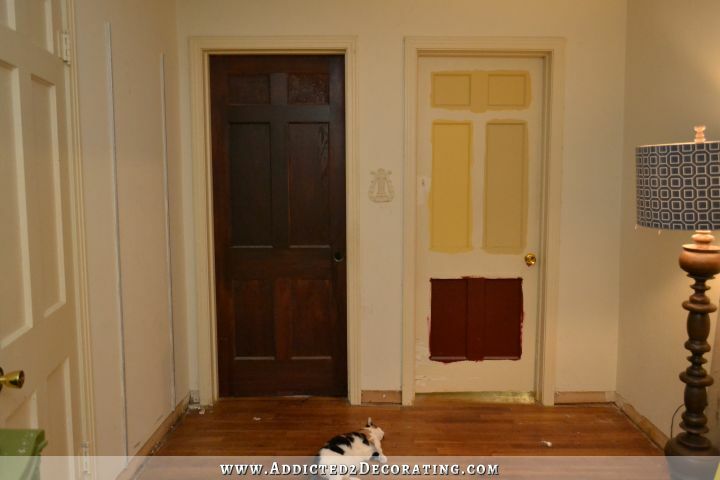 Install new trim — door casings, crown moulding, baseboards. 4. Find an awesome ceiling light. 5. Sand and re-Waterlox the floor (just like I did in the entryway and dining room recently). 6. Build a hall tree. That last one is going to be the fun project for the hallway. I no longer have a coat closet, and I really don’t want one. Any closet added to this hallway will make it start feeling cramped and small again. I like the open feeling. So a built-in hall tree will give people a place to hang coats and scarves (during those two months of cold-ish weather we might possibly get each year 😀 ) and purses, etc., without making the hallway feel cramped. I like the painted finish with the stained wood seat and the upholstered cushion. I think I would like cabinets on the top, though. So we’ll see what I can come up with. I’ll have plenty of time to come up with just the right design while I’m working on the drywall, doors, and trim that have to be done first. So I’ll be circling back around to the dining room at some point, as I can find time (and motivation) to get all of those redundant projects finished. In the meantime, hopefully I can start making progress elsewhere. I feel like I’ve been spinning my wheels for a while now, and this year will be over before we know it. There are just over five months left, and I really want to end this year feeling like I’ve made a great deal of progress. Right now, I’m feeling like this year so far has been a wash. I don’t like that feeling at all, so I need to get busy wherever I feel motivated to work. And right now, I feel like I can find motivation in the hallway. Next Post Moving Forward On The Breakfast Room, Pantry, and More! The year has been a wash?? I bet if you listed all that you have done I think you would be amazed at how much you have accomplished this year. Plus the fact that your stepfather passed away, you had the break-in scare, and all the other things going on in your life that you don’t blog about. You amaze me with all that you do. I do believe you should work on giving yourself more credit. 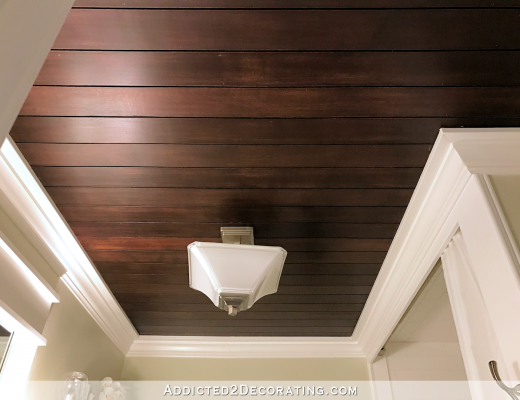 You know, when I see the “after” pictures of the rooms not even finished yet and then look at a “before” photo of any where in the house, my jaw just drops. I get that you’re frustrated with repetition, but from someone who doesn’t see it 24/7, the changes are phenomenal. You should be very, very proud. I completely agree about the table! I think you don’t like it and might need permission to let it go. So here is my permission to let it go if you need to. I think it is holding you back from joyfully finishing the dining room. It might even be a better fit for the breakfast room. What if you built and stained your own table? Oh, Kristi, you are so hard on yourself! A wash? Are you kidding me? When you think that just gaze upon your beautiful foyer. I love what you have done! 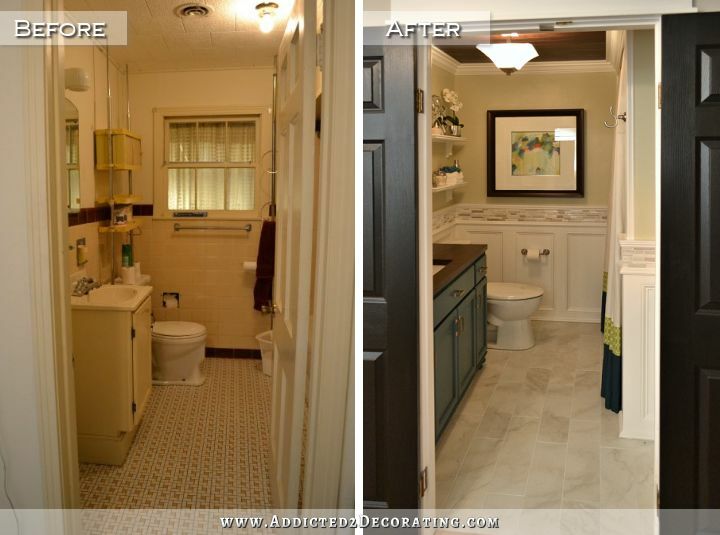 Your hallway looks awesome, and I followed you all the way in your kitchen reno! It’s beautiful! 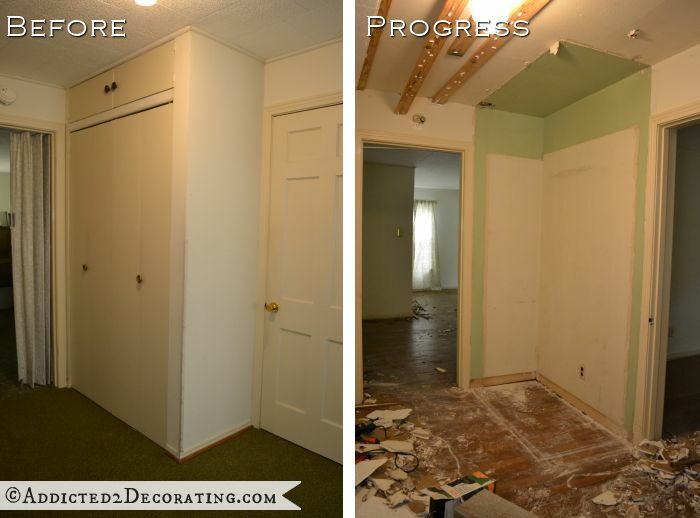 I have remodeled and painted just about every room in our house! Like you, I get very tired of redundant, tedious work and move on to something else. However, I had to stop doing that because I was not getting anything finished so finishing a room or project has been my vow! We will see how long it lasts! So looking forward to following you and your progress! Love the hall tree design but I would reconsider the idea of putting cabinets on top if you don’t have high ceilings. Would make the space seem more open with moulding on top like in the pic and would match your other wainscoting, etc. Storage under the cushions for extra gloves and such would be great and easy for Matt. A wash? I think we are all going….um…NOTTA for you! Listen…we all “stall”…. It’s just what happens….but you’re AMAZING at what you do…. We all in STILL in AWE of everything you accomplish…I mean come on my dear……you built a CHAIR from scratch!!!!! Take it easy on yourself……your doing GREAT!!!!!! Have a fabulous day…..drink something you love…..and take a breath…..you remain AWESOME……and we all love seeing your posts and reading about what your doing……thank you for taking time to share your life…..
A wash? I aspire to a year with that much wash checked off my list! I think you have the right idea…start getting excited about what’s next on your list and build that plan. There will always be unfinished business and revisiting…. Your plan sounds great! Maybe you can find a local woman (or man) who sews. You could pay them to finish the roman shades. At least that would be one thing off your list. I would also suggest, when you start the chairs (not the built from scratch) that you paint all of them at the same time instead of completing one chair (I know it is much more satisfying to see a completed chair), then when you are ready to start the upholstering, do all the backs or all the seats at one time, again, instead of being tempted to finish one. I think if you do it this way, you will get them done faster. If you are like most of us, and we know you are, you want to see the completed look. Just this one time, force yourself to do it differently. I bet you will finish them much faster. Good luck. Looking forward to seeing the hall tree. Ok so I definitely get the redundant upholstery jobs!! I had 8 chairs where I reupholstered the seats, backs and some of the arm. I could not get my self started because it looked like so much (even though it was a much smaller job than yours!) So what I did was line them up like an assembly line. One week all I did was reupholster the seats right on down the line. I found that as I went I got very proficient at it as I picked up skill on each one. The next week I did the seat backs the same way. And the next week I did the arms. I didn’t feel pushed or stressed and I did it all in the evening after I got home from work. In three weeks they were all done and the fact that all of them were started with continuous progress I always felt motivated! I love the things you do! That sounds like a wonderful way to go about it! You won’t see one done…ugh..five more to go. Instead…wow! !…six chairs with the seats all done and complete! I think there are always ebbs and flows with our energy and sense of mission. With the exception of those obsessive folks, that is. I am definitely with you on losing energy for the repetitive tasks. I think you need to cut yourself some slack! You are too close to this. As Deb said above, when the before and after space photos are seen side by side they are jaw-dropping. 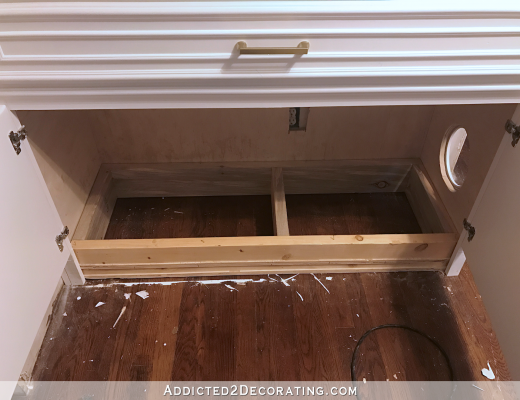 You are doing phenomenal work, and I don’t think you understand how much your readers admire your openness about the whole remodeling process. You are fearless about tackling things, and humble enough to let us know when things didn’t work out. Exactly why I hate offerings like HGTV. Not real life at all. Do what makes you feel satisfied, and one day the motivation to complete the chairs and window treatments will return and you will zip through it. Thanks for the honesty. I for one can relate. Kristie, you are so hard on yourself; most everyone agrees that you’ve accomplished quite a bit while dodging the curveballs life flings at you. I agree with the assembly line approach – that way you won’t have that feeling every time you finish one chair of slight disappointment because you still have 5, 4, 3 etc to go. And if you’re not ready now then put the dining room table in it with the chairs you have and you can use it until you are. The room is beautiful so enjoy it as is! You do SO much (yes, I know it’s your job but, jeepers) I’m amazed at all you do. I do believe that any one of us would be so proud if we were able to accomplish ONE of your projects in any given three month time span. Firstly congrats on getting the work hired out for your breakfast room/pantry floor being leveled and dry walling done……that will be a huge help for you and as you say, it will then be ready for you after the hallway project. I can understand you wanting to move on to another project and do the hallway and design and make your hall tree, then tackle the dining chairs and Roman blinds on the side. Also I think visually it makes a lot of sense to do the hallway, then you have a good line of sight for completed renovations that flow from one to the other….the entryway, music room, kitchen, hallway and the bathroom. I like some of the other comments about making the chairs in an assembly type line, doing all the seats at the same time, the backs at the same time etc. You will feel a big relief getting them progressively ‘done’ and then it shouldn’t feel so over whelming as with 1 completed 5 more to go. Looking from the outside, to us, this year has not been a wash, you have accomplished so much…..but it does get scary when you think that we are into the second part of July already and think to ourselves, where has the first half of the year gone!!!!! As always, we love your work, your honesty, your creativity and look forward to seeing the progress of your hallway renovation. Explain the black double doors in a “hallway” next to the kitchen, please. Where did you find these or did you build them? The photo shows white book shelves on either side. I really like that idea. thanks. you are doing a fantastic job. 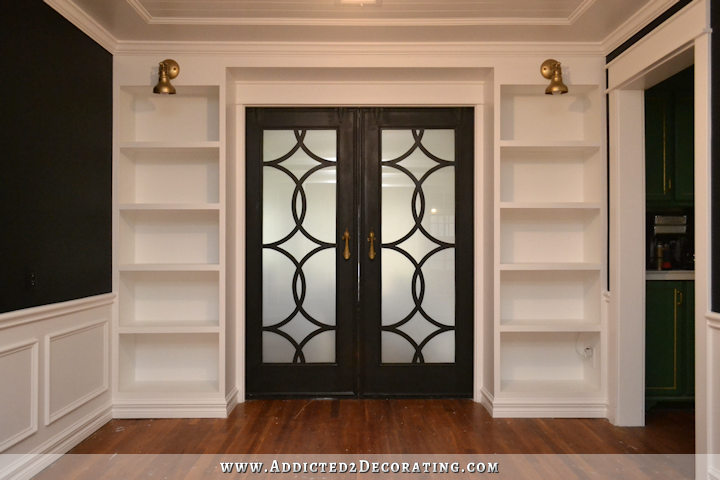 And I built the bookcases on either side to create the look of pocket doors instead of barn doors. It’s been a great year…. I love everything you do ! You are so creative and honest about the process. Very inspiring! I can’t wait to see the hallway with the coat tree, which is a great alternative to a coat closet. Btw, I adore the music room and I’m looking forward to the breakfast room when the time comes. So much to look forward to! You have your own way of approaching your projects and I say whatever works for you because at the end of the day each one is perfectly beautiful. Question on the lamp in one of your pictures. Was that a DIY project or was that store bought…if you purchased it….would you mind (if you remember) where you got it from. I’ve looking for that type of lamp-style base — that is very similar to a pottery barn lamp that I saw a few years ago that was ridiculously priced. PS Love that you are not afraid to move on to something else when you’re stuck…which my husband would allow that…lol.. If you mean the floor lamp in the hallway pic, that is from Target. I bought it about two years ago (I think), so I’m not sure if they still have them. I remember I had to purchase them online. It wasn’t an in-store item. Whenever I have a daunting/ overwhelming task to do and feel stuck, I like to take a small break and make something quick and fun to help me along. I totally understand where you are right now!! I am so excited to see your hall tree. Sorry, Paige! I just clicked “reply” on your comment to answer someone else’s question. :-/ Which means that you’ll be getting a long response in your email to a question that you didn’t even ask. 😀 Sorry! How are you planning to level your floor? Is it hardwood? The breakfast room is actually the only room in the house that has a slab concrete foundation. I honestly don’t know if it’s solid concrete (if it is, then it’s about two feet thick) or if it’s concrete on top of some sort of raised foundation structure. And I don’t have any idea how they’ll level it. It has a crack running through the middle, which has been there for probably 40+ years, from what I’ve heard from the previous owner. If it actually is a solid slab, then they’ll just pour a new top coat of concrete over it and level it. If it’s actually hollow under there, then I have no idea what the process is. Matt actually wants the entire slab floor jackhammered out, and wants a pier and beam foundation under there just like the rest of the house. I have a feeling that would be WAY too expensive, though. But I do plan to ask about it. I would start getting estimates now. You would have an idea of what you’re up against. I know how much you hate mudding drywall & it seems to burn you out. You should get those guys who did your ceiling back out after you hang it. Save your shoulders & your sanity. While they are there you could work on something else . It would probally be good to get all the drywall dust out of the center of your house before you move on anyway. Waiting to see what’s next. Oh remember when you got your windows done you got different opinions on how it should be done ? So you want to make sure who ever you’re dealing with knows if it’s solid or hollow under there. Since you don’t know you have to take their word so get a few estimates . I like your plan. A finished hallway will feel so nice. I think the dining table is what is bugging you and it doesn’t seem like any of the painted finishes are working. Some of your original inspiration tables were trestle/x-base style in wood. Would you consider making or buying something in that style? I feel like that would solve your dilemma because everything else is working. You’re so close in there! I love painted finishes, but always try to have one or more wood pieces in each room. I seriously love everything you do! You are incredibly talented and amazing. Seriously. I hate to be negative in anyway towards your ideas but you seem to be open to people sharing their opinions and then getting inspiration from those. So, honestly, I have a really hard time seeing that front room as a dining room. I feel like the combination of the table next to your cute fireplace just doesn’t work. The fireplace is awesome, I love it but it gets totally hidden with the table and also starts to look tiny. I can’t even imagine what the room will look like once all those chairs get in there and also the table. Perhaps it is just the photos as it is so hard to tell room size and scale in photos but everything with the room right now is just so lovely. I love it. I would duplicate it in my home. I would just not use the space as a dining room. In fact, the most lovely room in my home is our dining room. 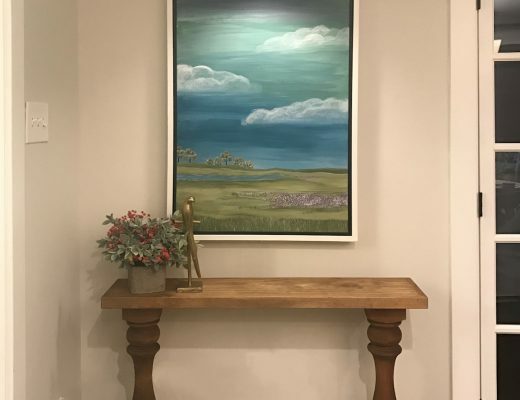 It has the best view and it is just a very calm and chill vibe to it and we have it decorated perfectly (for our style), however, it is just my husband and I at our house and we use the dining room about 5 times a year. I hate what a wasted space it is…I constantly try to figure out how to turn into to something else but, for our layout, there isn’t much else we can do there. Anyways, you seem to get hung up on things, have a heart to heart with yourself and then make a drastic change. I kind of love that about you! So, I can’t wait to see where things go next. Keep inspiring us! Take a break, work on something else then revisit the dining room with fresh eyes. I do that all the time with my art when I feel I’m going to screw up or already have and need the patience to fix it. You know that you need that now. You do such good quality work. I love your blog. Gosh, from where I sit, you’ve had an incredibly busy and productive year! And you’re about to have the nasty work done on the breakfast room. I think you’re in great shape. Enjoy working on your hallway! Giiiiirrrrrlllll, I say give yourself a break. You live in your job and have just experienced a pretty big change in your life. Do what inspires you! You’ll get it all done eventually. Maybe once you’re able to view the music room and dining room from a partially finished hallway, you’ll get some new inspiration. Kristi, I’m interested in knowing what you’ve worked out, about access into the bedroom, while the hall floors are being done. It takes a couple of days, doesn’t it? No doubt you’ve got some plan in mind. 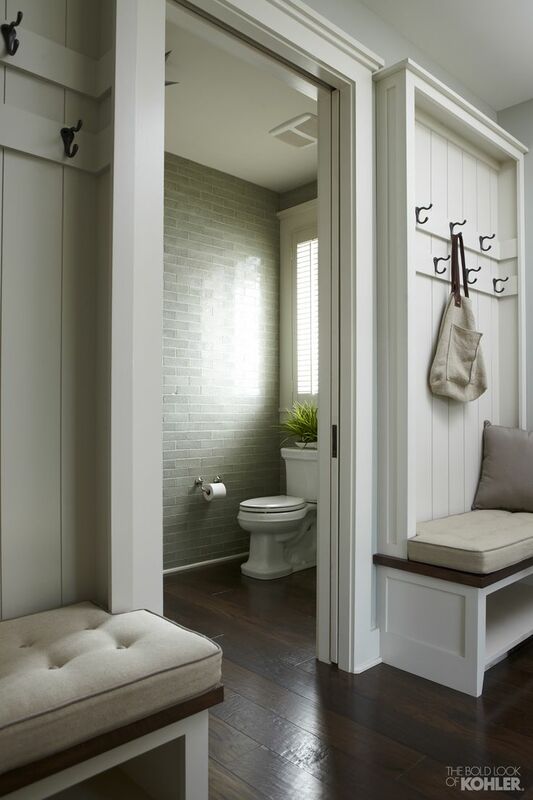 I love the double door on the bathroom. I think it’s a great idea for smaller baths and more people should use them. My only question is how does it work in real life? Do you love it or does it take some getting use to? I actually love it. It works great, and didn’t really take any getting used to. Ooooh, finally on to the rest of the house! This means all common areas now, right? Remember the nice tufted seat from the old living room, you could use it either as a seat or as the back of the seat in the hall tree. If you feel led to work on your hallway, go for it! You can use other time to finish the dining room projects. I like the idea of a hall tree with a small seat on it and a place for boots/shoes underneath. I thought you might like this for your hall?